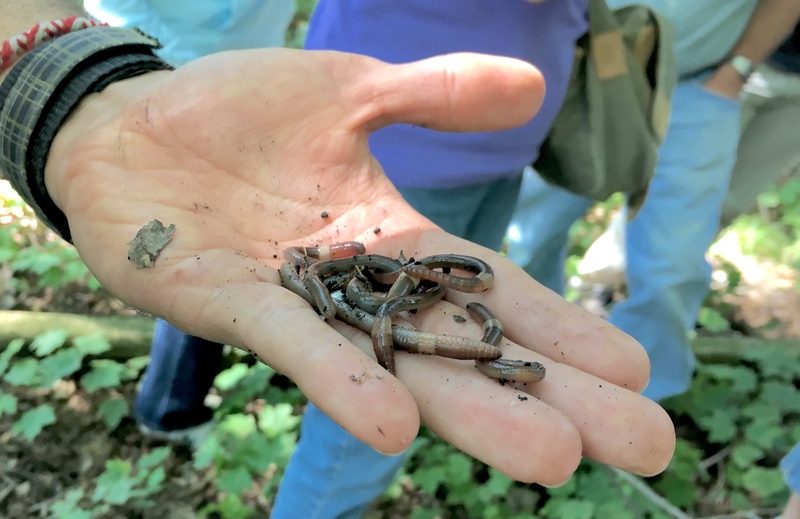 From Fitchburg to Governor’s Island and Monona to Middleton, teams of volunteers dispersed across the Madison area Sept. 10 in search of small, pink, wriggling invaders: jumping worms. Hunched over gardens, lawns and public parks, the teams poured a mustard tea onto the soil and scooped up the worms that surfaced to escape the irritant. True to their name, the invasive earthworms squirmed and leapt about before being counted and placed in plastic containers for transport. Back at the University of Wisconsin–Madison Arboretum, scientists would identify the species and pair the location with notes taken by the citizen scientist volunteers. All this information will be used to understand how far the invasive worms have spread — and perhaps how to slow their movement. First identified serendipitously on Arboretum grounds in 2013, the invasive jumping worm has spread throughout much of southern and central Wisconsin. Researchers are still studying their impact. The worms churn through leaf litter at a faster clip than their more sluggish earthworm cousins, potentially processing nutrients faster than plants are able to use them. (No earthworms are native to Wisconsin — most are from Europe; the jumping worms call Japan and Korea home). “We’ve all heard that worms are a gardener’s best friend. And that’s because they make nutrients available for plants. But these worms maybe do that a little too well,” says Carly Ziter, a graduate student in the lab of integrative biology Professor Monica Turner. Ziter, who organized the worm hunt as part of her work with the North Temperate Lakes Long-term Ecological Research program, says nutrients released too rapidly by the worms could be washed away, or change how plants grow, ultimately disrupting local ecosystems. 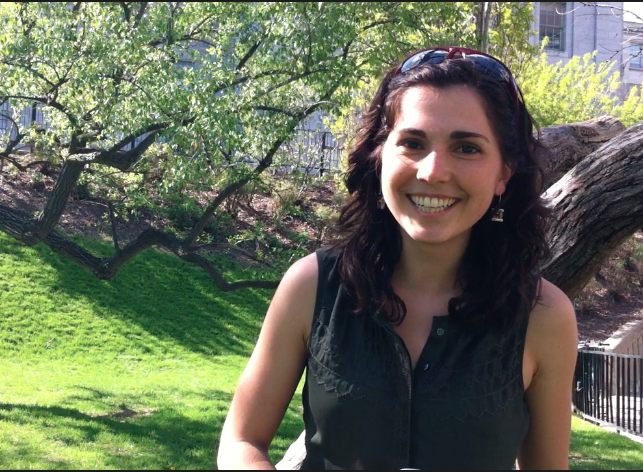 Graduate student Carly Ziter says the jumping worms do their job a little too well, disrupting local ecoysystems. “It’s like applying a fast-release fertilizer,” she says. 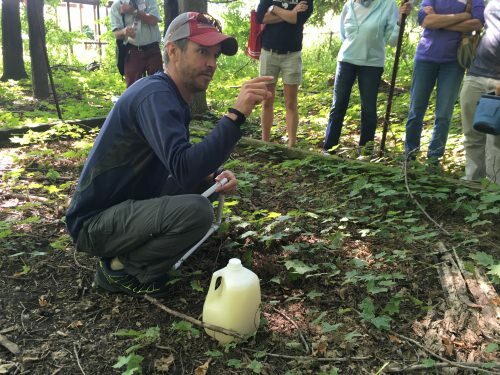 After a presentation on the worms to a few dozen volunteers, Ziter and Brad Herrick, the Arboretum ecologist, led the group out to the site where invasive worms were first spotted four years ago for a demonstration. 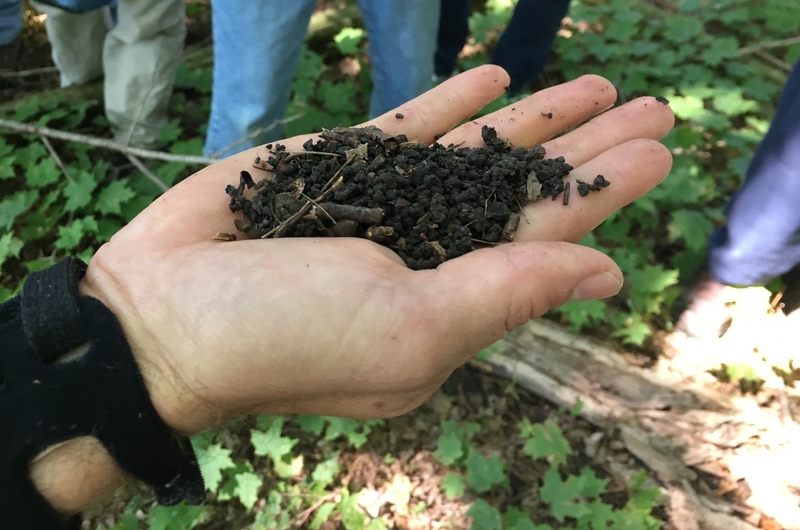 In a section of forest near the Arboretum’s nursery, Herrick cleared away leaf litter and poured water mixed with mustard powder onto a patch of soil. The same chemicals that add zing to a hot dog irritate the worms, which flee to the surface. After a full gallon of mustard tea seeped into the ground, a jumping worm came out, thrashing. With gallon jugs and bags of mustard in tow, the volunteers fanned out to the corners of the metro area in teams led by UW–Madison scientists. Residents volunteered their yards for the search and the city gave permission to sample public parks. Nancy Heiden had already seen the characteristic coffee ground-like soil left behind by the worms in her Shorewood Hills garden. As Heiden, Ziter and Madison resident Linda Layman poured mustard onto the soil, they recovered more than a dozen of the worms, confirming Heiden’s suspicions that they had invaded her yard. While the citizen scientists found the worms at Four Corners Park, Dudley Davis Quarry Park was free of them — for now. Perhaps the rocky quarry slowed their spread, ventured Ziter. The data collected by Heiden, Layman and the other teams spread throughout the Madison area will help answer some fundamental questions about these invaders that are usually hidden from view. As worries over the invasive worm have canceled plant sales and led to a flood of calls to the Arboretum from concerned residents, Ziter and her colleagues hope that this information will help communities throughout Wisconsin respond effectively to the wriggling threat.